60 years ago an OH was the toast of England cricket. This year marks the 60th anniversary of when an Old Herefordian was the toast of England cricket. Peter Richardson, who was born on July 4, 1931, was a stalwart of the school team for four years, serving as captain in the last season, 1948. His cricket development was slow but ever upwards and he became a Worcestershire star. He later played for Kent. In his first match as Worcestershire skipper he hit a century against Australia in the opening match of the season, his unbeaten 130 saving the county from defeat. An England call-up beckoned. 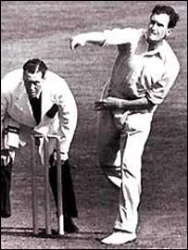 In his first match in 1956 he scored 81 and 73 against Australia and then struck 104 at Old Trafford, the encounter that earned Jim Laker legendary status with his capture of 19 wickets. Richardson went on to score 491 Test runs that year, the highest tally in the world. Richardson, who is in his 85th year, played in 34 Tests, scoring over 2,000 runs and in 1957 was one of the Wisden cricketers of the year. Colin Bateman, one-time Daily Express cricket correspondent, said the OH was one of the game's great characters. “Off the field he was a one-man entertainment show, particularly when the troops were stuck in some up-country billet in India. His sense of humour and sharp mind enlivened many a dull official function to the delight of his teammates. One can't help wondering what pranks he got up to in his days at HCS! Written by Nigel Heins. Photo from BBC Sport website.